So glad to hear you loved the recipe. Thank you so much for your feedback, Dean! I’ve never made prime rib before but decided to try it for a family dinner. 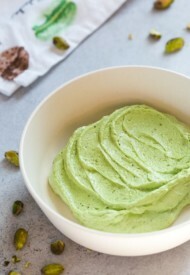 I searched Pinterest and finally found this recipe. Thank you! It turned out perfect. Everyone loved it. This was the best prime rib we ever ate!! I followed your instructions exactly and the prime rib was amazing and cooked to perfection! Thank you! I am looking forward to combining two of your prime rib crust recipes together and serving 11 lbs Bone-in Prime Rib Roast to my family for New Years Day!!! I am a big fan of the reverse sear on steaks, so this should be great!!! Do you have any wine suggestions for this party? Hi Shinee, I am making a three bone, 8.2 pound prime rib. How long for medium rare, more on the rare side? Also, how long do you recommend sitting out prior to cooking. Thank you! I can’t wait to try your recipe. Wow ! I was always scared to try and cook this afraid of messing up an expensive cut of meat … I took the plunge using this recipe and boy was I glad I did ! Perfect and oh so easy to make ! Thank You for sharing ! This reverse process worked great ! Wow! I had a 2 bone prime rib, which was about 5 lbs. Admittedly, I was nervous as it was a dinner for 4 of us for Xmas Eve…with no back up if it didn’t work. I was worried about the time. I read and reread the directions. I put a metal thermometer in the roast while it cooked and back it up with a digital thermometer which I thought was maybe more reliable. I followed directions exactly. It turned out perfectly! Thank you! Everyone was impressed. I used this recipe for my first time ever making a Prime Rib!! I was incredibly nervous because, not only was it my first time, but I was doing it for Christmas dinner! I followed the directions (maybe added a half hr onto the time) and it came out perfect! I’d add a picture of it if I should! My family was impressed! Holy cow was our roast delicious cooked by this method! I was a bit concerned as there was not much juice at the bottom of the pan (I thought it was under done even though thermometer said otherwise). I had a 2+ lb roast and it perfect medium rare. I did not cook at 500 for the crust as we were hungry. My boyfriend has declared we will be cooking our prime rib this way from now on. lol. Thanks for the recipe! Looking forward to trying this recipe! I have a question though since I am getting mixed answers from other people i have asked. 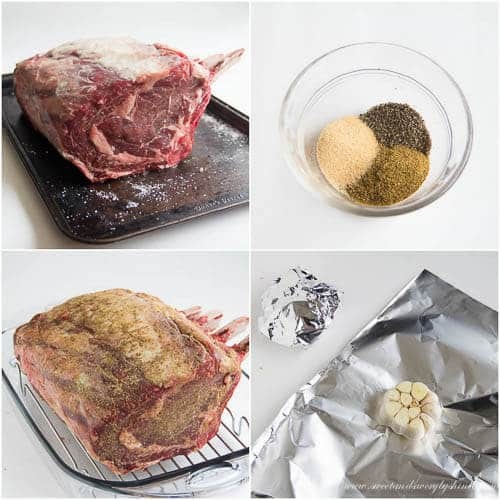 Do you place your meat thermometer at the beginning and leave it in your roast the entire time it’s cooking or do you just check the temperature after a few hours? I am a leave it the whole time girl but wanting another opinion! Thanks! I have only ate prime rib once in my life much less ever tried to cook one on my own. This Christmas we decided to try something different than the normal ham and Mac and cheese dinner and everyone wanted prime rib. After days of reading and research I came across this article and decided it sounded to be the best approach. I followed it step by step and for my first try it turned out beautiful!!! My father in law said it was better than any he had ate in any restaurant. My husband and I had it for dinner Christmas Day also warmed in an iron skillet with butter. After such great results I recommend this to any first timer!!! Thank you!! Never made prime rib before, but love it and wanted to give it a try. I had a 9.3 lb. prime rib serving 10 people. Checked several recipes and chose to follow this method. Just did salt pepper and chopped garlic on the outside. The meat cost nearly $100 so did not want to mess it up. It was absolutely perfect. Perfectly pink all the way to the edges with a nice crisp outside. I started at 175, but eventually edged up to 185, then 200. It took about 5 hours to get it to 125 degrees. Longer than I had planned. I think if you are flexible with dinner time and are patient, it will pay off. Served with au jus (just added beef broth to the drippings, whisked in with the crumbles from the meat, and brought to a boil) and a good horseradish sauce. Green beans. Mashed potatoes and gravy. Super meal and all 10 were extremely pleased. I was especially pleased. Glad I tried it. Loved it! Just tried the recipe, I can’t thank you enough. Christmas roast was spot on perfect . Hi Shinee.. I looked the internet over for reverse searing and found your site. I was concerned about time of cook and what nailed it down for me were all the comments from your readers. Experiences count!!! I live in Colorado at 6800 feet so elevation does affect cooking times. I had a 9 1/2 pound 4-bone choice grade rib roast that I pre-salted and put in fridge uncovered on a rack for three days. I cooked it in a friends oven at 195 deg’s. His stove was running 43 deg’s higher than its set temp. It is important that one takes a good digital temp probe and reads the actual temp of their cook stove because they do vary. 5 hours later roast was at 130 degrees so I pulled and rested for 30 min while the Green Egg charcoal smoker was blasting up to 600 degrees..put roast on for 10 min and cut off bones and sliced meat into 1/2 inch slices..Perfectly medium rare from stem to stern..best roast ever!! served with a whipped cream (beaten heavy cream) horseradish sauce. The sauce consists of butter, egg yolks, whipped cream, lemon juice, minced onion, parsley and salt and pepper..and its very complimentary to the meat. All I put on the meat was salt, fresh ground black and white pepper, some thyme and dried minced garlic. I have always been afraid to make Prime Rib. I make it today and it turned out perfect. Thanks so much for this step by step recipe. Hi, Nina. It’ll take about 3-3.5 hours for 3.5lbs roast to reach 120-125°F internal temperature, which will yield a perfect medium rare prime rib. Hope you’ll enjoy! Merry Christmas! Made this for my family. At first I thought that was waaayyy too much cumin, but it was perfect. I’ll do this from now on! Yay, so happy you all enjoyed it. Thank you for your feedback. Merry Christmas, Vicki! Hi, Michelle. No, no need to cover while roasting at 200°F. However, cover while resting it. Hope you’ll enjoy, and please let us know how it turns out. Thank you, and Merry Christmas!!! Thinking about doing this for New Years. Does it make a difference what cut of meat, select versus choice or prime? Hi, Lonnie. I’d highly recommend prime as it has more marbling thus flavor. It’s pricier, but it’s totally worth the splurge. Happy Holidays! Choice will have less marbling than prime so little less juicy, tender and flavorful. You can still make an amazing roast with choice though. When I use choice I like to brine the meat, a google search will get you some great brine recipes. This helps infuse flavor and retain the juices. I’ll brine no less than 48hrs before cook day so the meat still has time to dry in the fridge and dry season about 24hr out. Hope that helps, Happy Holidays. Terrific recipe!! Came out unbelievably good. I’m doing any future prime rib roasts exactly like this! Wish i could attach a pic!! I have my 16lb prime rib in the fridge to start at 630 am!! Im thinking 6.5 hours at 220*Do i put any roasted garlic butter on it before i put it in 500 degree’s? Cant wait for some beautiful med prime rib Christmas dinner!! Hi, Alicia. I’d suggest putting your garlic butter before putting it in the oven at 200°F, like I did in this recipe. And I’d love to see a photo of your prime rib. You can submit it here. Awesome!! Thank you so much for your feedback, Sandy. Merry Christmas!!! I just put a 6 lb prime rib roast in the oven Can’t wait to try it. How long until it hits 125 degrees? Hey, Mark. Sorry I didn’t get back to you sooner, as we celebrated our Christmas tonight. I hope your prime rib turned out good. I just got my roast from grocery store. Is it must that I wait till the next day to cook? Hi, Simon. No, it’s not required to cook the next day. Air-drying overnight helps create a nice crust, but it’s not a deal breaker at all. Hope you’ll enjoy your perfect prime rib. Merry Christmas! Hi, I am making an 8lb boneless prime rib. How long do you think I should cook it? Also do all of the directions still apply with a boneless prime rib? Hi, Deb. It’ll be about 4 hours for your 8lb boneless prime rib to reach 120-125°F internal temp. This method works for both bone-in and boneless prime rib. Hope you enjoy, and please let us know how it turns out. Merry Christmas! Looking forward to preparing our Christmas Prime Rib using your recipe! We’re going with a 12lb roast. What is your recommendation as far as cooking time for medium rare? Thank you in advance for your help. Hi, Donna. It’ll be 4.5-5 hours for your 12lbs roast to reach 120-125°F internal temp at 200°F, which will yield perfect medium rare prime rib. But for accuracy, please make sure to use a meat thermometer. Merry Christmas!! I want to try this method to make my first ever standing rib roast. I realize it is more about a temperature than a time thing but I do need a ballpark to know how early I will need to get started on Christmas morning. You see, I have an 8 bone, 16 pound roast. Using your method I have no idea how many hours this could take because the oven temperature will be so low. Any advice is most appreciated! Hi, Charlotte. It’ll take about 5.5 hours at 200°F for your 16lbs roast to reach 120-125°F internal temp. Hope this helps. Let us know how it turns out. Merry Christmas! Just an FYI. If you have only one thermometer you are better off buying two pieces of meat that are the same. If you get 2 of the 5 lb roasts you can predict more accurately that when the one with the thermometer in it is done so is the other as opposed to a 7 lb and 3 lb. That seems to be a more common sense thought that I thought I’d share with you. I’m going roast a 16lb ribs . Use your recipe, abou how many hours before taking out to rest? Hi, Wenmei. It’ll take about 5.5 hours at 200°F for your 16lbs roast to reach 120-125°F internal temp. Hope this helps. Let us know how it turns out. Merry Christmas! Very good point, Caroline. Thank you for sharing your thoughts. Merry Christmas!!! Hi, Donna. Sorry for my tardy response. You probably already bought your roast by now. But I’d personally go with 2 5lbs roasts. And yes, cover with a foil while resting. Foil pan with a rack sounds perfect. I have never used canned au jus though, so no advice on that. Merry Christmas!! You don’t say about the garlic? What to do with that? Hi, Liz. You can serve it along with the meat, spread it on a toast/bread, etc. I am confused about the oven temp for my 5lb roast. How do I start and end with the temps and sitting time. Hi, Tammy. It’ll take about 3.5 hours at 200°F oven temp for your 5lb roast to reach 120-125°F internal temperature, which will yield a perfect medium rare prime rib. If you want more done, just continue cooking until your roast reaches your desired temperature. (Use a meat thermometer for accuracy.) Then you take the roast out, heat your oven to 500°F and roast the prime rib for about 10 minutes for a beautiful crust. Hope this clarifies everything for you. Let me know how it turns out. Merry Christmas!!! Thanks for responding, I mean what do you do after you wrap it in foil? Does it just go in for four hours with the meat and come out before the final sear? Can you tell me do you use a roast or bake function on your oven to make this roast? I’ll be making one for Christmas dinner and I keep seeing the word “roast” used. Also I have a convection oven will that make a difference in cooking/roasting time? Hi, Jenny. My oven only had one standard setting, no convection, no other settings. So I’m not sure what to advice. We just moved into a new house though and now I have a new convection oven with different roast/bake settings, so I’m planning on trying convection settings tomorrow. My suggestion is to try your roast setting with convection. Hope it turns out great for you. Let me know, and Merry Christmas! I’m plan to make a 7# bone in standing rib for Christmas. Would like to try this method but our whole family prefers medium to medium well. Can I use this method but increase the initial cook time to 130-135 before removing to rest & brown? Yes, Tammy. That’ll work perfect. Hope you all enjoy it, and please let me know how it turns out. Merry Christmas! Made my 7# standing rib roast for Christmas & it was absolutely delicious. As I mentioned in my message to you, we like our meat medium to medium well. I roasted it to approx 140 degrees, removed & covered with foil for approx 1 hr before returning it to oven for 10 min @ 500 degrees. Will never make my rib roast any other way. Have a Happy & Healthy New Year & Thank You for this great recipe. I will try this for Christmas Eve Dinner! When I bring the roast out of the oven after the searing does it have to rest again? Or can I immediately dig in? Thank you. Hi, Lisa. I’ve done both ways. But resting is highly recommended, 5-10min should be good. Hope you enjoy, and Merry Christmas! Will this same method work in an electric roaster? Hi, Cathy. I have no experience with cooking prime rib in an electric roaster. So I have no advice. When do you add the cherry tomatoes and garlic to the roasting pan. And should I add water or broth/wine to the pan? Hi, Sylvi. Garlic goes in right away with the prime rib at the begining. However, add cherry tomatoes and asparagus at the final 10-minute roasting. I’m giving this a try for Christmas and have a question. You say to place the roast ‘on’ a roasting pan, do you mean on the rack or just in the pan? Hi, Debbie. Sorry for confusion. I mean on the rack. Do you an approximate cooking time for a 20 pound roast using your cooking method? I hosting Christmas Dinner and every year I have issues cooking the prime rib. Hi, Anna. I’d estimate about 5.5 hours at 200°F. If it reaches your desired internal temp, don’t worry. Just take it out, cover with foil and rest until you’re ready to serve. Do the final sear before serving. Hope you enjoy. And please let us know how it turns out. I’m going to make this roast for Christmas…but mine is 5.5 lbs and I don’t want a medium cooked roast, I’d like it more rare to medium rare. What temp should it be at before I take it out of oven to set? I know it continues to cook afterwards, so how do I ensure it not to get to medium? Why anyone would want anything beyond a medium rare, it’s a puzzle to me. Lol. Please respond soon!!! Thanks so much for this awesome method. Hi, Shawnee. For medium rare, take the roast out when it reaches 120°F. It’ll get to about 125°F while resting. Hope you enjoy, and please let us know how it turns out. I want to cook my prime rib to medium well. What do I have to do to get it to the right temp. Hi, Kathy. Just cook it longer until the internal temperature reaches the desired doneness. Good afternoon Shinee, I will be trying this method for Christmas dinner this year. We will be serving 15 people. How big of a roast should I use and how long should that take? I’m excited to try something different since I usually do it the other way around. Hi, Kimberly. I’m excited for you to try this method of cooking a prime rib. General rule for portion planning: 1/2 pound per guest, if you’re buying boneless prime rib, but I also like to add an additional pound or two just in case. So for 15 peoples, 9lbs boneless prime rib should do. If you’re buying a bone-in prime rib, plan on 2 people per rib. You’ll need a meat thermometer to check for desired doneness, but I’d estimate about 4 hours at 200°F for 9lbs roast to reach 130°F internal temp. Hope this helps. Let us know how it turns out. i have never had a roast as good as the one i made yesterday. i followed the reverse cooking method and when that prime rib came out it was absolutely gorgeous and mouth watering. it melted in your mouth good. everybody in my family loved it and i made yorkshire pudding, oh man. it was definitely tastey. So glad you all got to enjoy it, Linda. Thank you for sharing your feedback. Yay, so so happy to read your feedback, Madison!! Reverse-sear is truly a fool-proof method. Hello! When resting overnight are you using regular salt or kosher salt? Hi, Candice. I use coarse kosher salt for everything. Doing this on the grill this afternoon. I used a little bit of Mr. Stubbs liquid smoke mixed with the oil before putting on the rub. I also use a idevice remote thermometer to make sure I nail the medium rare temp. My uncle gave me a resteraunt hack. Keep a pan of au juice on the stove and folk that like there’s a little more done just put it in the juice for a minute or 2. Never have a piece of meat that doesn’t please everyone. Thanks Shinee for a great recipe! Kevin, grilling sounds amazing!!! Thank you for your feedback. Hello. I am going to make this prime rib for Christmas Eve. When I’m cooking it at 200 do I leave it uncovered or covered during this Time? Hi, Diane! Cook it uncovered. Hope you’ll enjoy the perfect prime rib. Let us know how it turns out. Excellent advice and recipe. I would say a bit closer to 21/2 hours at 200 degrees and 125 degrees internal before removing it for a medium prime rib but otherwise spot on. John, thank you for your feedback! 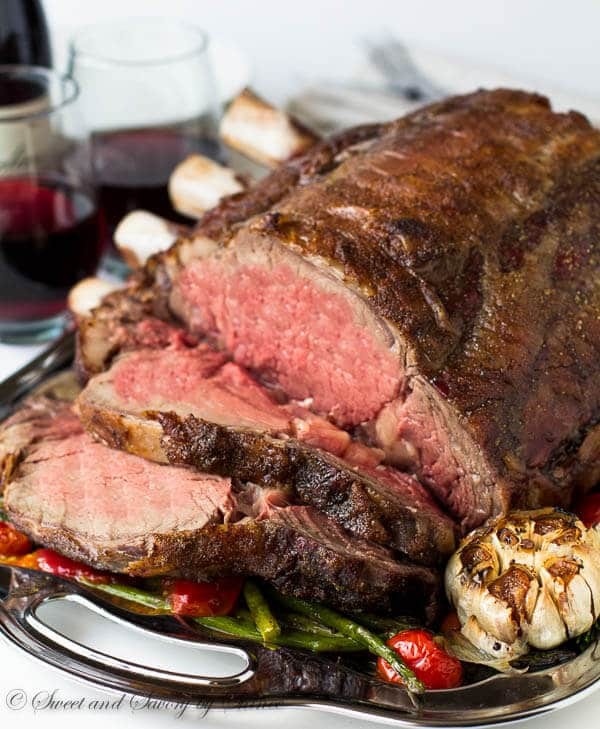 What size of prime rib roast did you use? The cook time will depend on the size of the roast. This was delicious. I don’t ever post comments on anything online, but I just wanted to say thank you for this recipe. I used my own spices, not the ones used in this recipe but the cooking method I used from you. It came out so tasty. Restaurant quality. Thanks so much for posting this! Aww, Danielle! Thank you SO much for your feedback! So happy you enjoyed it. I am making this tomorrow for a party of 20, the roast I chose was a prime rib boneless, do I follow the same directions and same cooking times and temperatures? Hi, Liala! Yes, everything should be pretty much the same. Here’s my boneless prime rib recipe with garlic and herb crust. Hope you’ll enjoy it. And please let us know how it turned out. Thank you! Hi, I’m planning on cooking a seven pound roast for dinner tonight. At such a low temperature, what am I looking at time-wise per pound? At 300 F I usually do about 20 minutes per pound. Hi, Cynthia. It’s hard to say exact time for roasting. For 7lb roast, I’d say 3.5-4 hours to reach 130°F internal temperature. Hope you’ll love this method. Please keep us posted with your feedback. Hi Shinee, I made the roast and it was delicious. I let it stand on the counter for two hours before putting it in the oven. I didn’t put the salt on it as I am not allowed much salt. The only thing I would do next time is roast it until 130 as not everyone likes it as rare as me. I might also switch out the cumin for thyme. I served the roast with a cognac cream sauce that was delicious. Definitely making this again. Cynthia, thank you for coming back and leaving your feedback. So glad it turned out good!! And that cognac cream sauce sounds amazing! Would you share your recipe, please? Hi Shinee, the cognac sauce recipe comes from Beef Tenderloin with Cognac Cream Sauce by striped spatula.com. A very good recipe as well. Thanks, Cynthia. I’ll check that out. The best Prime Rib recipe I’ve tasted, my family loves it! I wouldn’t change a thing! Thank you so much, Maria Anna! Cooked as written. Perfect! Crusty outside and like butter inside! Will never make a rib roast differently. Kathy, so glad you tried this method to cook your prime rib! Thank you for your feedback! Very easy recipe with an awesome outcome!The reverse sear method is definitely the way to cook Prime Rib…Thank you!! Glad you agree, Gordon. Thank you for your feedback! Hi Shinee! I am about to cook my 5.3lb prime roast but didn’t get to salt it overnight. However I did generously kosher salt it (like I do for our reg filet mignon) for the pat two hours as it gets to room temp. My question is, well with the steaks I rinse off the salt and pat dry, do I do the same for the roast? Hi, Gina! I’m so sorry for my late response. I’m sure by now you’ve made and ate the prime rib. And I hope it turned out well. But anyway, to answer your question, I never rinse the salt off, so I won’t advise to do so here as well. Let me know how your turned out. Hi, what if I bought the prime rib the same day and didn’t have time to let it sit overnight in the fridge? Hi, Gaither. Letting the roast dry in the fridge overnight helps create a better crust. Otherwise, you can cook the roast the same day you buy it. Hi, Warren! I’m so glad you decided to try this reverse-searing method! Hope you and your guests loved it! Your seasoning sounds so good too, I’ll have to try that as well. Looking forward to hear your feedback. Hey Shinee!! I made it home from church at exactly 12:30, and the roast was dead on 130 degrees (exactly 4.5 hrs @ 220). I immediately pulled it out as my goal was 120 degrees for a more rare finished product. I let it rest for 30 minutes and it peaked at 138. I increased the oven to 500 and put the roast back in for exactly 10 minutes for the sear, and it worked perfectly. I sliced it almost immediately, and it was a beautiful, juicy medium rare from outside to center. Honestly, IMO the 130 degrees ended up working perfectly for the 8 guests as everyone doesn’t like a true rare finish, but doesn’t want to tell you that! There were 10 adults total, and I ended up with about a 2 lb piece (about 6″) that I can’t wait to use for a French dip for dinner tomorrow night! !Thanks for the recipe, and I hope the details I provided help others in their decisions when making their own prime rib!! Warren! So glad you got perfect result!! And thank you so much for sharing all the details, it’s definitely really helpful! Hello Warren, I am thinking about making this recipe and was curious about the ratio of your seasonings-yours sounds amazing! Sorry for the delayed response Daisy, I replied using my phone a few weeks ago but see that never went through… I am cooking another rib tomorrow so I measured it out this time. This mix made 1 cup of thick slurry paste. Do I use the roasting pan at 200 with the lid on or off? Hi! I’m making this tonight! And I was wondering if during the resting period, if I could remove the juices to make an au jus, or if I needed to keep that in the roasting pan when I put back into the oven at 500 degree? Thanks! Hi, Chris. No, no water in the pan. Did everyone like the cumin? I’m thinking of substituting fresh thyme… Any thoughts? Hi, Kerri. You can totally omit the cumin, and fresh thyme sounds great. Enjoy! After almost 40 years of cooking rib roasts in the “traditional” method, I decided to try this, for this past Christmas dinner, and it was spectacular. Absolutely the best rib roast I’ve ever made, and I was a trained chef a lifetime ago. The flavor and appearance of the finished product was far superior to any roast I’d ever made. There are multiple sites with this basic method, but this is the most concise I’ve found. I will absolutely use this recipe every time. I thank you, and my family thanks you. You may have mentioned this before but what oven setting do you use? Convection or standard? Roast or bake? Hi, Ellen. My oven is pretty basic, and I don’t have any of those settings. 🙂 So I say standard bake would be fine. It was cooked perfectly! We like ours med. rare so I cooked it to an internal temp of 124F before tenting it and letting it rest 30 min. Searing at 500 worked up a very nicely browned and crisp crust. It rested again while we organized for the meal. This will be my go-to method for prime ribs roasts. My family was very impressed with this cooking method. The only thing I would advise is to rest the roast on a separate plate so you can remove all the drippings from the roasting pan before searing. I had quite a bit of smoke (my fault)! Other than that, it was perfect! Thank you! Bonnie, so glad you loved this technique! Thank you for your feedback and your tips! Sooo gooood! Followed your directions to the T, and we really enjoyed it, especially for a first attempt! I will for sure do it again! Perfect!!! The only thing I would add is to increase the oven temperature by 25 degrees for high altitude cooking like we do in Wyoming. Thank you. Thank you, thank, thank you Shinee! I followed all your steps and it came out beautifully perfect! I planned for a little extra time for my 10-pounder, and used my meat thermometer, and it all went according to plan. My whole family loved it! 💚💚 Happy New Year! Hey Shinee! Wanted to let you know that I used your recipe on my 2nd attempt at making prime rib. The first was a disaster and there was a “ready cooked” version I bought between the one I ruined and this one. The family LOVED it… it was all but gone by the end of dinner! Thanks for sharing! I will be using this recipe for a long time to come! Hi, Shines. Got a great deal on a small 2 lb prime rib. Just for me. No special occasion. Problem is that I won’t be able to stand it bone down. It will probably have to lie flat. Recommendations? Temp per pound? Can you help? Hi, Jo. We had a small piece of prime rib a little while ago and it took about 2-3 hours at 200F. Hope you’ll enjoy yours. Happy New Year! This website is really hard to use. It’s a disaster of ad traps. Hi, Mary. You’re more than welcome to go to other websites with no ads. Thanks! Okay, I’ve read this recipe and comments 3 times now. Tomorrow I cook a 7lb bone-in roast for the first time, hoping that 3.5-4 hours at 200 is correct for this weight. Roast took slightly longer than I calculated yet when carved it was perfect…medium rare. Tasted great and everyone enjoyed the meal. Thank you! Hi, Linda! Sorry for late response. And you’re correct, your roast should take about 3.5-4 hours at 200°F. Hope you’ll enjoy! It turned it beautiful! Took slightly longer than planned but certainly was worth it! Excellent! I have successfully prepared prime rib for many years and have experimented and come to prefer slow roasting techniques. Was intrigued by the searing at end of roasting period. Worked beautifully, and my family dubbed it Best Ever! Hi, Arstella. I know what you mean. 🙂 My mom doesn’t eat it unless it’s well done. I usually cook her slice in a skillet on stove top. Hope you can do the same. Enjoy! I don’t have kosher salt. Can I use pink Himalayan salt? Yes, any kind of salt will work. Merry Christmas, Vannelli! Ok I’m cooking my first prime rib for the family, crossing my fingers! I am a pretty good cook but I’m nervous. Lol. You had some good feedback from others so I’m really excited to try your method! I even bought a new meat thermometer cuz I was worried my old one would decide not to work. Haha. I order a roast to feed 25 and now I’m intimidated to make this 21lb roast!! I have a convection oven how long do u think it will take me to cook? To make sure I don’t run behind on dinner time should I cook it early and let it sit out and put back in oven on 500 right before guests arrive? Hi, Gwen! I totally understand the pressure. 🙂 Yes, I’d suggest start early, as the roast can sit at room temperature for a while, and you can just pop it in the oven at 500 before guests arrive. Good luck, and have fun! Merry Christmas! This will be my first prime rib! I want to make it for Christmas. Once I roast the garlic what do I do with it? Put it in the oven with the prime rib just to penetrate the meat with the aroma? The recipe doesn’t say what to do. Hi, Sofia! The roasted garlic can be served along with the meat, spread on a toast, or with vegetables. 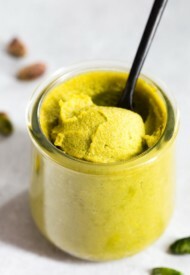 The flavor gets soft and somewhat sweet, perfect as a condiment. Good luck with your first prime rib!!! Hi, Sofia, I am cooking my first Prime Rib, too. How did your Christmas dinner work out? Bet it was delicious. Gwen. How long did it take that 21 lb prime rib to cook at 200degrees? I have one I’m making and nothing online to calculate one that large. Elizabeth, How long did it take you to cook your 21lb roast? I’m cooking one for Christmas Dinner. I asked the butcher for a 13 lb prime rib and picked up a 17 lb roast with my name on it. How long should I roast it? Should I use convection at 200 or regular oven? How long do you think it will take? Hi, Diane! I cooked mine in regular oven. For 17lb roast, I’d calculate about 5.5-hours to reach 125°F. It came out amazing! Best one I’ve ever made. No pressure about timing. Let it sit for 3 hours when it reached 125. Put back in the oven at 400 until it reached 135 and let it rest for 30 minutes. I’ll never make it any other way! How did it turn out? I have a 17lb roast I want to do at 200 degress. About how many minutes per pound? This sounds wonderful. A couple of questions; how big a roast for 14 people?Also, can I cook it to 120 degrees, take it out of the oven for 2 plus hours and then put it back in at 500 degrees? We are going to church at 5 and then coming back for dinner at 7. Hi, Anne. For boneless roast, you should plan about 1/2lb to 3/4lb per person. For bone-in prime rib, about 1lb per person. I think, 120degrees is a bit too low, it’ll take very long to cook. But yeah, you can rest the roast for 2 hours and sear in hot oven right before serving. So I want to make this for Christmas but my mom and sister both like it well done. How do I make everyone happy?? I know the feeling. I’m making mine rare and a lot of my family is the same. So I’m planning to slice it then sear it to their liking in a pan…we’ll see how it pans out ? Hi, Lisa. I know what you mean. 🙂 My mom doesn’t eat it unless it’s well done. I usually cook her slice in a skillet on stove top. Hope you can do the same. Enjoy! Hi, Alishia. I’m sooo excited for you! You can simply use a large baking pan and cooling rack that would fit in your baking pan. If you scroll up the post, you’ll see what I mean in my step by step photo. I didn’t have a roasting pan when I made this post. 🙂 Good luck, and let us know how it turned out! Do I place the meat directly into the pan or do I place it on a rack? Hi, Thuy. Place it in on a rack. What a fantastic recipe! After many past failed attempts at making prime rib, last night’s with this recipe was an absolute winner! Thanks SO much for sharing your method!! Hi, Susan! So glad to hear you’ve tried and loved this method! Thank you for your feedback! I’m making a 6 lb prime rib for New Year’s Eve tonight! Mine is in the fridge uncovered and salted as we speak, I went with boneless but I’m sure following your method and using the thermometer will ensure a great result. I can’t wait to fill the house with the smell of roasting prime rib! I used the method you recommend and it turned out beautifully! I have never have had a rib roast that tasted like that. It was just beautiful and delicious. It was yummy! Thank you for a perfect way to cook large roasts beautifully and tastefully! Yum! So, so happy you’ve cooked a perfect prime rib! Thank you for stopping by and leaving your feedback, Irene! It means so much to me. Happy New Year! Hey Shinee – I made this tonight and it was EXCELLENT! I was out of cumin so I used Italian seasoning (which went better with my sides anyways) but I followed your cooking directions exactly. My roast was 5.92 lb and I let it sit at room temp for 2 hours before putting it in the oven. I cooked it for 3.5 hours at 200 degrees and it was 125 degrees when I took it out. After sitting out of the oven for 30 minutes, I cooked it at 500 degrees for 8 minutes. It was 133 degrees when I took it out, I let it sit for 10-15 minutes before cutting and it was PERFECT. Nice and red, just how I like it. Seriously the best prime rib I’ve ever had – my husband agreed. My 4 year old requested to have it every night ???? This will be my go-to cooking method from now on! Sharon, yay! So glad to hear you made a perfect prime rib! I made one too this year, and my baby (just 11 months) has been loving it too. 🙂 Thanks for your feedback! Very good recipe. Used different seasonings, but followed the instructions on cooking. I was worried it wasn’t cooked enough because when I checked the temp a lot of blood came out. When I sliced it open it was a perfect medium well. My first rib roast was perfect. My husband got on one knee and asked me to marry him again. Aww, Sarah, so happy for you! Thank you for trying my recipe and for leaving your feedback. 🙂 Happy Holidays! My 9.6 lb prime rib took 5.5 hours @ 200 degrees and another 10 mins @ 500 degrees to get to medium-rare. I did rest it for 30 mins before putting back in the oven for 10 mins @ 500 degrees. The outside of the roast had lots of flavor but the middle was a little bland. Next time I will rub the salt on at least 2-3 days in advance instead of overnight so the salt can penetrate more deeply inside the meat. I would definitely make this recipe again with the changes. Hi, May! So happy you’ve tried the recipe and I appreciate your feedback and notes. I agree the earlier you salt the roast, the better. 6-10 minutes, or until it’s nice and brown. Merry Christmas, Jakki! Does this method produce sufficient pan drippings to make Yorkshire pudding? Hi, Caren! No, actually it doesn’t produce much drippings with this method. All the juices stay in the meat. 🙂 Merry Christmas! hi, i saw you wondered about yorkshire pudding? no there are not a lot of drippings but i put beef stock in the bottom of my pan, when i took the roast out of the oven the broth was dark and thickened a little so i used that. perfect yorkshire puddings, they were real tasty. good luck. I am making my first prime rib tomorrow using your method. Can you please suggest some nice sides to go with this for Christmas dinner? Hi, Tammy! Thanks for choosing my recipe for your holiday menu! So excited for you. So lots of great options for sides: scalloped potatoes and mashed potatoes are always perfect match for prime rib. I’m making scalloped potatoes. Also, this easy creamed corn and roasted butternut squash are great too. Merry Christmas!! This cooking method makes sooo much sense! I’m cooking a 5 lb for tonight. I’m so excited i found your blog!! I do have one question though. I want to add Fresh Rosemary to the technique any suggestions on how to add it to the process? Also how do we seeve roasted garlic? Just spread on bread or roast? Thank you for all you do! Hi, Susan. So happy you found my blog! Fresh rosemary sounds awesome. I’d chop it finely and mix it with the seasoning. And the rub it all over the roast, per direction. Roasted garlic is fantastic on bread. You can also add it in mashed potatoes, if you’re serving it. I don’t spread it on a roast though. Hope you all enjoy perfect prime rib. And let me know how it turns out, and share a pic if you get a chance. 🙂 Merry Christmas, Susan! I am doing the same tonight with the rosemary. How long does a 5lb rib bake at 200? Hi, Rae! Every oven is different, so it’s crucial to use a meat thermometer for precise timing. It’ll take about 3.5-4 hours at 200°F for bone-in rib. Hope this helps. Merry Christmas! Where did you place your rack in the oven? I placed the rack on 2 second rack from the bottom, otherwise it won’t fit in my oven. Hope this helps, Josh. Let me know your prime rib turns out, if you try it. Happy Holidays! Do the asparagus and tomatoes go in to roast the entire time or just at the 500 degree time? Can’t wait to do this on a Christmas Eve! Hi, Courtney! Asparagus and tomatoes will go only at the last roasting time at 500°F. Hope you’ll enjoy. Don’t forget to snap a pic and share it with me. Merry Christmas! Would cooking times & temp be the same if I used an electric turkey roaster instead of my regular oven? Hi, Rachel. To be honest, I have no experience with electric turkey roaster, so I have no idea how it compares with regular oven. How long should I cook a 14lb bone in roast? My first time making one this large for Christmas this year. Hi, Mary! I’d say to plan on for 4-4.5 hours at 200°F, but start checking the internal temperature at 3.5 hours mark. Hope you’ll enjoy that perfect prime rib. And let me know how it turns out. Merry Christmas! Our 14lb Christmas toast turned out beautifully. Thank you!!! Yay, so happy to hear that, Mary! Thanks for reporting back! Happy 2017! Just one question do you need to cover the roast when baking at 200. Hi, Coleen. No, covering isn’t necessary. I used this methid last year fir a small group and LOVED it!! I will be making 2 10lb prime ribs for 21 people this year. How would it need to be in oven for this method? Also, I have a convection oven, would I use it in regular mode or convection mode. Hi, Christine! So glad you loved this method! As for 2 prime ribs, I’ll be honest and admit that I’ve never roasted 2 roast at once. But there are a few things to keep in mind… 1. Make sure to position the prime ribs with enough space in between, so air can circulate. 2. Convection settings helps circulate air, which in return expedites the cooking time, BUT since you have 2 roasts, it may just mean that cooking time won’t change much. (Again, no experience with convection oven or roasting 2 roast at once, so these are all just my theory.) Thermometer would be your best friend. Hope it all turns out great again this year. I’d love to hear how it turns out. 🙂 Merry Christmas! Thanks for the reply!! Since it is 10lbs, should I extend time a bit or just use thermometer? I don’t think you’ll need to extend time, if you use convection settings. But thermometer would be the best guide. I’d suggest to plan for an extra time to cook, but keep a close eye on thermometer. Whenever it reaches the right temp, you can take it out and rest until almost ready to serve. Hope this makes sense. Yay, that’s amazing! Thanks so much for letting me know how it turned out. Merry Christmas and Happy New Year, Christine! I’m cooking a two bone prime rib for my family for dinner tonight, how long should I cook on 200 for? Unfortunately I can’t find my thermometer and I don’t want to mess it up! Ah, it’s so hard to say exactly how long it will take, Amber. Every oven is different and it’s just difficult to throw exact number. It shouldn’t be too much different from 4-bone prime rib though. Sorry not being very helpful here. Hope it turns out good. 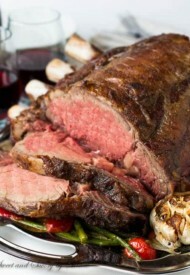 I will be making a prime rib roast for our Christmas party on Saturday. This will be my first time making prime rib. So it will be interesting! I am so glad I found your website! I do have a question, how long should I bake a 7-8 lbs. roast at 200 degrees for? Same question for baking at 500 degrees? Thank you so much for your help! Also, I will be making a boneless roast. How does this change the instructions? Hi, Erika! So excited you’re going to roast your first prime rib!! 3.5-4 hours of cook time at low temp will still apply to 7-8lb prime rib. I highly suggest having a meat thermometer for accuracy though. As for boneless prime rib, unfortunately I have no advice. But it shouldn’t be much different, again with meat thermometer you can keep close eye on it. 😉 Hope you’ll love it and let me know how it turns out. 2. 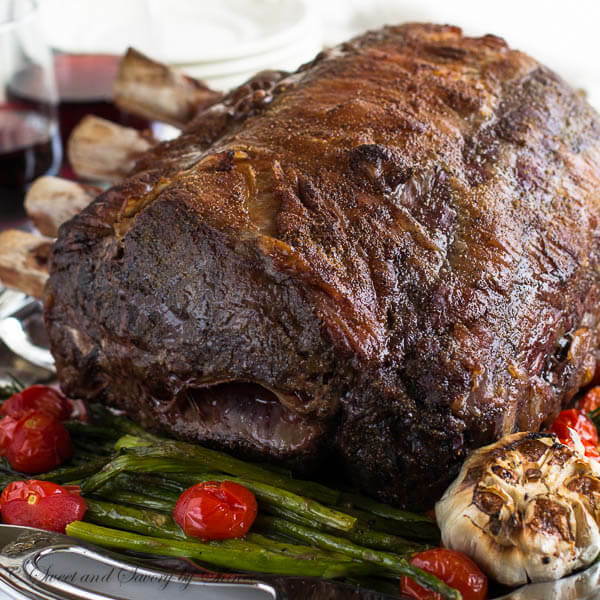 Do you know how to cook a Rib Roast? Needless to say, I came to Pinterest and this was my fav. Wish me luck! I want my son, (who is coming in from California) to really think I know what I’m doing! Hi, Cheryl! So glad you liked this recipe. You’ll do great! Hope your son will be impressed with your perfect prime rib on Christmas. Please do report back how it turned out. Wish you all Merry Christmas! Great timing Shinee! We are planning that for Christmas and I have not made for awhile. Thanks. 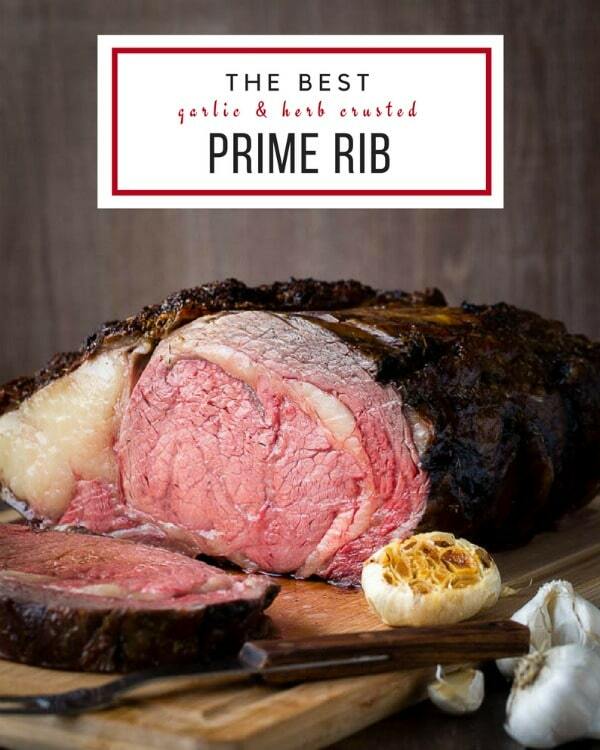 Prime rib is perfect Christmas dinner! Hope you all have a great holiday, Richard! Shinee I am using this recipe for thanksgiving. However I am givin an extended rest period to allow cooking other dishes in the oven before the 500 degree final part. I hope it works out okay! Hi, Kevin! Thanks for making it part of your holiday! I’m sure it’d be fine, just make sure to keep it covered and warm. Hope you have a wonderful Thanksgiving! Hi Kevin! That’s my plan for new years. I need my oven for other dishes. How did your Roast turn out with the long rest period? Prime rib is one of our favorites. Your recipe looks amazing. Thanks for sharing at the Inspiration Spotlight party. Pinned & shared. our previous recipe was featured at the party. Have a happy Easter. Thank you, Theresa, for stopping by! I love prime rib but didn’t do well my first attempt at cooking it. Thanks so much for sharing your recipe on the perfect prime rib! Maybe mine will work out better next time! Do try again! You’ve got it, Kristina!! I got Kenji Lopez-Alt’s book for a present, but admit that I haven’t gotten into it in any detail. 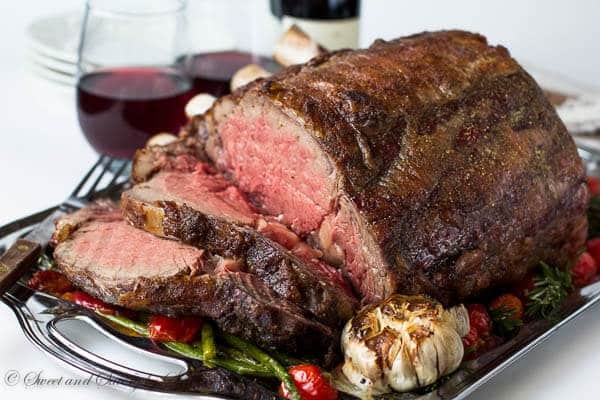 This is an incredible post – a dreamy looking prime rib that you make look so easy. If I ever cook one, I’m definitely using this as my guide. Ohmygosh, Laura, I’ve been wanting to buy that book. I love his approach and how he explains everything! Gotta go buy the book now, while I remember. 🙂 Thanks for stopping by! It looks delicious! And this is vey true about Mongolians that we eat brown meet, not red. And couple of weeks ago i’ve ordered a medium steak that tasted exactely like a Mongolian barbeque! Seared outside and juicy inside! That’s awesome that you got to try medium steak! Thanks for reading! Gorgeous prime rib Shinee. I have never heard of this method and I really must try it because yours is absolute perfection. Thank you, Allie! It’s not very common method, but it sure does work wonders!